Mediena is a 6-star unit that plays the Magic Attacker role. She has great stats for a mage style character and is set up with powerful magic. Dual Black Magic is her only ability and it’s the only one she needs. She has a wealth of powerful damaging magic spells but also some support ones. Her Traits set her up to be a great mage by giving her boosts in her important stats while also giving an MP recover, Rod mastery, and immunity to sleep, disease and petrify. Her magic is where she shines as an attacker. Lots of coverage with how far the spells spread on the elemental scale along with some good debuff spells. Freeze and Zoblizza are two of her strongest attacks, both being Ice element. Freeze dealing good damage and decreasing Ice resistance while Zoblizza does consecutive damage 9 times peaking at 12x damage which is great. Out of everything, she is a mage character through and through. No real heals so having her with a healer wouldn’t be a bad idea but other than that she’s pretty well covered on most all fronts. Verdict: A great magic unit with great coverage. Works well when paired with a healer. Mediena is neutral to all elements and status ailments. Mediena can equip 6 weapons and 4 armor. 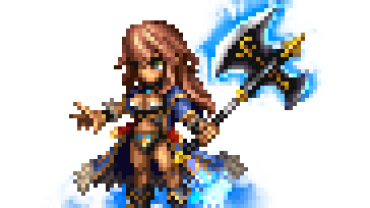 An immortal great mage with a myriad of spells at her disposal that has donned many names. Although Mediena’s appearance is that of a youthful lady, it is rumored that she is actually centuries old. Many mages revere her as the being closest to the true essence of magic, but her lack of interest in the mortal world often keeps her from ever showing herself.